Ronald D. was a 32 year old handyman. He had his own business. He would go from home to home offering his services to make minor repairs, do yard-work, paint, etc. On this particular day, he was hired by Homeowner to cut some trees in the garden. The Homeowner gave him a ladder and a chainsaw to use (Ronald did not have his own equipment). Ronald went approximately 4-6 feet up the ladder and began using the chainsaw on some branches. That’s when tragedy struck. The blade (chain) of the saw became lodged into some of the wood, forcing the saw to ricochet backward into Ronald’s face. Unfortunately, this particular saw was such that it did not shut off automatically when its trigger was released. The blade, spinning at a high rate of speed, went directly into Ronald’s face, slicing him open from the top of his nose all the way down through his chin. He was rushed to the hospital where he underwent emergency reconstructive surgery, receiving hundreds of stitches. Ronald D. was left with an obvious scar going down the length of his face. Ronald was told from the very beginning that he did not have a case. In fact, he spoke with no less than four (4) lawyers who advised him that his case was either barred by Florida’s Worker’s Compensation laws or by comparative negligence. 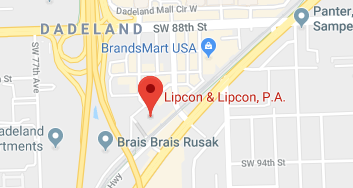 But then he called David Lipcon, of Lipcon & Lipcon, P.A., a Personal Injury Law Firm located in Miami. Lipcon knew that the Homeowner had a responsibility to provide Ronald D. with a safe place to work, had an obligation to provide him with equipment that was safe and proper for its intended use, and had a duty to warn Ronald of any potential danger (when Homeowner knew, or at the very least, should have known, that the chainsaw was defective or broken). Once Mr. Lipcon obtained possession of the chainsaw, he had his team of experts analyze it and concluded that not only was it an improper tool to use for that particular job, but that the blade (chain) was also in disrepair and not fit to cut wood. Homeowner never should have given Ronald that tool. Homeowner’s Insurance Carrier at first refused to even negotiate a settlement. It took the position that this was a worker’s compensation claim, only, and therefor barred. But then, once Mr. Lipcon filed the lawsuit, took the deposition of the homeowner and offered the expert opinion of his engineer, Homeowner’s Insurance Carrier knew that if the case was concluded at Trial, there would be a verdict in excess of its policy limits. RESULT: The case was settled a few months after the lawsuit was filed for $825,000.00.